House Clipart - Cartoon House Characters - House Mascot Clip Art Cartoon Characters! 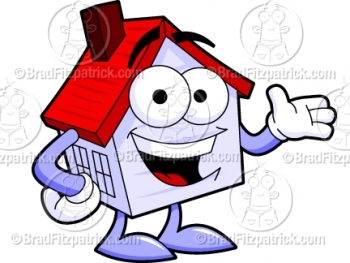 Cartoon House Mascot Clip Art! Looking for a Cartoon House Mascot? Well, you've come to the right place! This little house mascot would make a great little character representative for your home improvement website or real estate business. If you need this Cartoon House Character with a prop or pose not found here, please feel free to contact me with your specific request so I can create it for you and add it to the collection! Cartoon House Clipart - Cartoon Houses - House Mascot Clip Art Characters! Please be sure to check back often because I will be constantly updating this page with more poses and illustrations of this Cartoon House Mascot as they become available. Thanks!